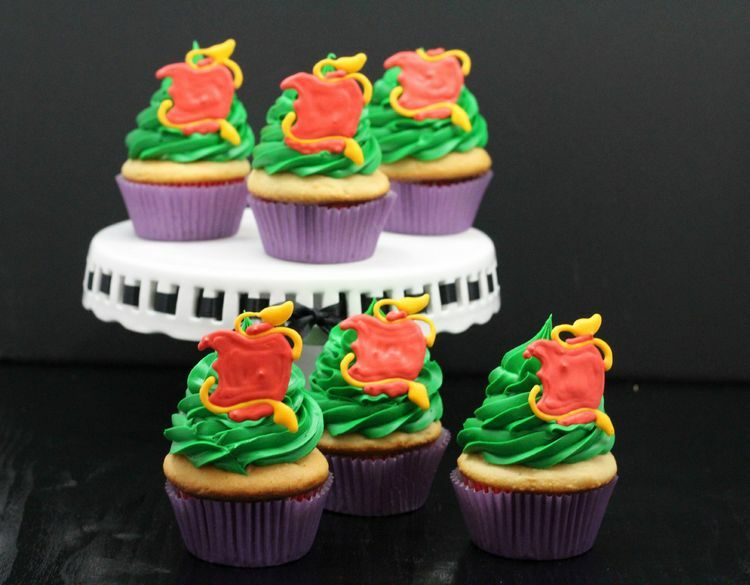 When it comes to these Descendants-Inspired Cupcakes, giving in to your wicked side never tasted so good! 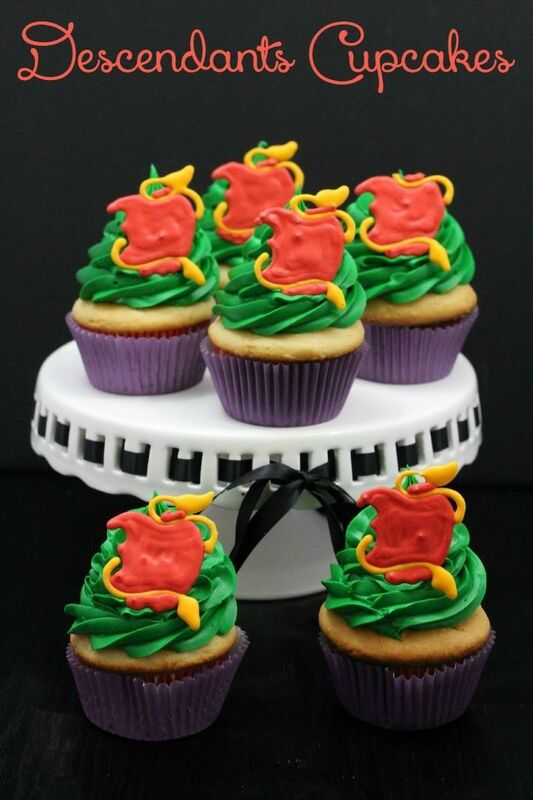 These cupcakes will be a great hit for your upcoming Christmas party or sleepover party. You can make them ahead of time or just gather the ingredients and bake them with your besties. It’s fun eating cupcakes and it’s even exciting baking them with your friends. You can even impress your mom and family with these cupcakes or use them for your next bake sale. Let’s get started, shall we? Using a liquid measuring cup measure the buttermilk. Add several drops of orange gel food coloring. Mix well to blend the color. Divide the icing into thirds. The first bowl with a third of the icing add several drops of red gel food coloring. Mix well. In the second bowl with a third of the icing add several drops of yellow gel food coloring. Mix well. In the third bowl of icing no coloring will be added this icing will remain white. Locate a picture of the Disney Descendants Logo on Google. Print the picture with several small Descendants Logo color. Tape this picture with small numerous logos of it on it to a cookie sheet. Tape wax paper (covering the copies of the logo) to the cookie sheet . Follow the color and features as printed on the paper. Using a small pastry bag fill with the red royal icing and a #2 tip. Start by outlining the apple first. Fill in the image with the apple icing. Allow this to dry for 30-60 seconds. Using a small pastry bag fill with the white royal icing and a #2 tip. Start by outlining the apple bite first. Fill in the bite mark with a thick white line of icing. Allow this to dry for 30-60 seconds. Using a small pastry bag fill with the golden yellow royal icing and a #2 tip. Start by outlining both snakes first. Fill in both snakes with golden yellow icing. Ensure that the logo is dry, gently touch one of them with your finger if it allows you to push in on the icing allow it to dry more. If the logo is dry then it will have a hard feeling not allowing you to push in on it. Cut the wax paper holding the completed logo into squares surrounding the completed cupcakedecoration. Once the logo is dry, carefully peel the wax paper off of their backs. Place on the frosted cupcake. 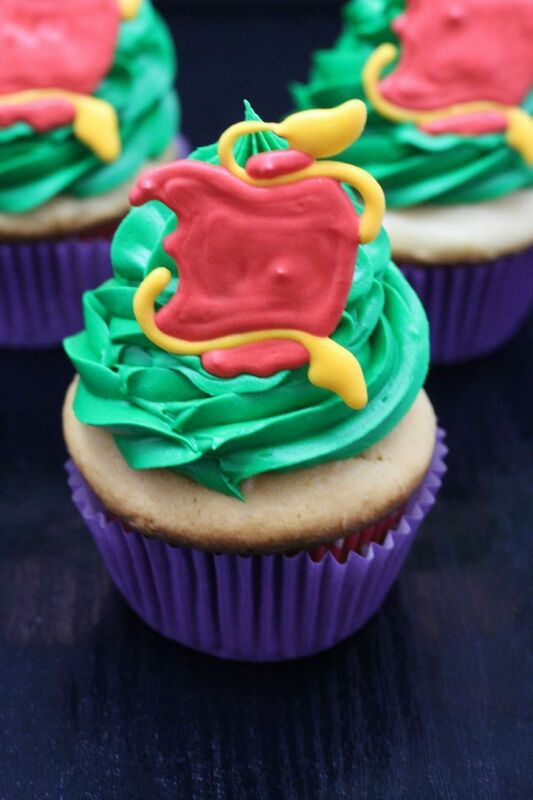 Isn’t this Descendants-Inspired Cupcakes recipe beautiful. I know it requires some time to bake and decorate, that’s why I recommend doing in groups. You can split the tasks and it will be a fun way to spend time with your besties. Once finished, don’t forget to watch one of the movies we recommend. Are you planning to see Disney’s Descendant’s? Who is your favorite character?